The Group for High Resolution Sea Surface Temperature (GHRSST) was established in 2002 to foster an international focus and coordination for the development of a new generation of global, multi-sensor, high-resolution near real time SST datasets. It brings together international space agencies, research institutes, universities, and government agencies to collectively address the scientific, logistical and managerial challenges posed by creating the SST datasets and services within the Project. The overall aim of the GHRSST is to provide the best quality sea surface temperature data for applications in short, medium and decadal/climate time scales in the most cost effective and efficient manner through international collaboration and scientific innovation. Large volumes of data and data services must be harnessed together to deliver the new generation of global coverage high resolution SST data sets that meet the GHRSST User Requirements. A basic 'version-1.0' of the Regional/Global Task Sharing (R/GTS) framework has been implemented in an internationally distributed manner. GHRSST datasets Global and regional coverage SST datasets are now produced by GHRSST RDAC Regional Data Assembly Centers (RDACs) in Australia, Japan, USA and Europe. RDAC SST datasets are passed in near real time to the operational GHRSST GDAC Global Data Assembly Center (GDAC) at the PO.DAAC where the are integrated together and served to the global application community. The GDAC plays an essential role in GHRSST quality control and data and metadata management. Research and development within GHRSST continues to address the challenges of SST diurnal variability, skin temperature deviations, uncertainty estimates, cloud masking, high latitude SST, and validation/verification of GHRSST datasets. GHRSST data management teams continue to refine the GHRSST data management structures to provide a functional system that conforms to international and federal directives (e.g., ISO, INSPIRE, CEOS). 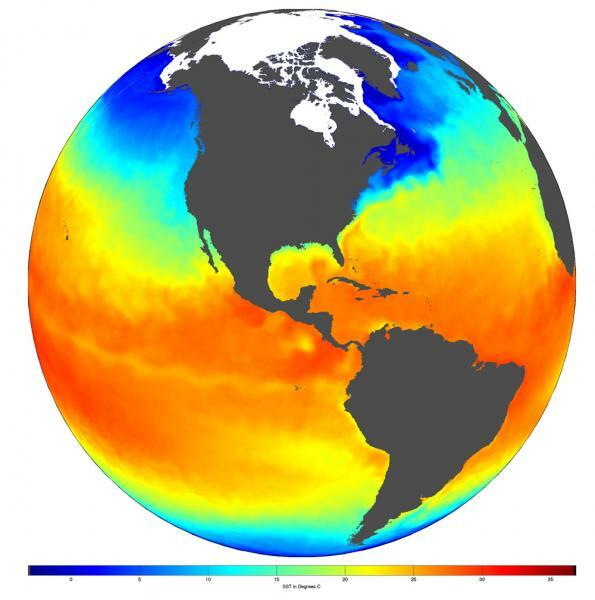 The Long Term Stewardship and Reanalysis Facility (LTSRF) operates at the NOAA National Centers for Environmental Information (NCEI), formerly the National Oceanographic Data Center (NODC), ingesting and archiving all GHRSST datasets on a daily basis in collaboration with the GDAC. The GHRSST International Project Office, jointly funded by the European Space Agency and Met Office, UK, continues to manage the international co-ordination of the project. There are so many GHRSST data sets, how do I decide which one to use? What spatial and temporal resolutions do I need? Do I need a skin or foundation (bulk) temperature? Do I need regularly gridded data with no data gaps? What temporal range do I need? Do I need near real time data? Do I need level 2 ungridded data that contains ancillary data fields as well as complete error characteristics for each pixel? Level 2P datasets are either skin (infrared) or subskin (microwave) SST. Level 4 datasets have the word “foundation”, “blended”, “skin”, etc. embedded in the filename, indicating what type of measurement they are.